China has been the largest tea producer in the world for 13 consecutive years and was also the largest exporter in 2017, but experts have said that the lack of big domestic brands and other factors mean that the Chinese tea industry is not as strong as it should be. According to data from the China Tea Marketing Association, the output of dry tea in China in 2017 was 2.609 million tons, up by 6.1 percent year-on-year. China's total tea exports reached 355,000 tons in 2017, valued at $1.61 billion and accounting for 20.6 percent of total tea exports in the world, followed by Sri Lanka ($1.5 billion), Kenya ($1.4 billion) and India ($591.2 million), data from World's Top Exports showed. 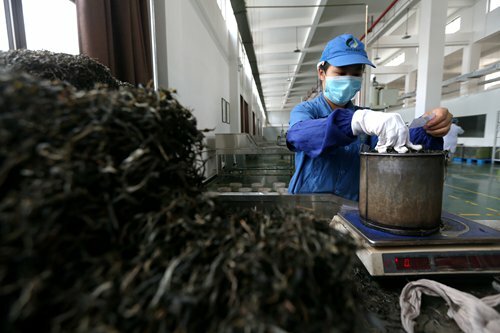 However, Zhu Danpeng, a Guangzhou-based food industry analyst, told the Global Times that China's tea export volume is lower than it should be given the scale of the Chinese tea industry. This is largely due to the lack of large domestic tea brands, which also results in low profit for the industry, especially in the export sector, he said. "Take Lipton [a brand owned by consumer goods multinational Unilever] - it uses cheap tea leaves produced in China and makes them into teabags, a clever idea that appeals to the preferences of Western people. And it sells at much higher prices all around the world," Zhu said. "Brands like Lipton attach great importance to promotion and communication with customers, and that makes them well-known," he noted. Duan Liyuan, an overseas sales manager at Zuxiang Organic Tea Garden, told the Global Times that as well as the lack of big domestic brands, China has some other disadvantages in terms of black tea exports. Data from the Tea Board of India showed that India's tea exports reached 265,326 tons in 2017, the highest level in 36 years. "The British, who formed the habit of drinking black tea in the 17th century, introduced tea trees to India and Sri Lanka in the late 19th century, so these countries have standard and centralized black tea plantations with products that fit the taste of Europeans, though the quality might not be better than tea produced in China," Duan told the Global Times on Tuesday. "In addition, thanks to relatively low labor costs, they can get better profits than the Chinese tea industry," according to Duan. Located in Southwest China's Yunnan Province, home to high-quality tea production, Duan's company exports black tea to countries including Germany, France and the US. Duan said that her company is seeking opportunities in the domestic market rather than focusing on exports. With the upgrading of the domestic consumption level, Chinese people are more willing to pay higher prices for good-quality tea, while Western people prefer to buy cost-effective products. "Tea of the same quality can be sold for twice as much in China as in other countries. Against this backdrop, more than 60 percent of our tea products were sold in China in 2017 compared with 40 percent the year before," Duan said. "The Belt and Road (B&R) initiative also gives us some benefits. For example, the rail route linking China and Europe cuts the transport time by half and prevents the risk of tea becoming damp when transported by sea," she noted.